So far, 650- and counting- online qualifiers have secured their places in MILLIONS Online. They will take their places alongside thousands of others in the single biggest online poker tournament EVER to fight for their slice of the $20 million guaranteed prizepool – all hoping to win the $2.5 million top prize. How do you join the massed ranks of those who’ve already taken their place at the MILLIONS Online start line? It’s easy. To register for the event, click on the Tournaments tab in the partypoker lobby, and select the MILLIONS Online category. From there, you can register for your chosen start day by clicking on the tournament and hitting the Register button. Simple! The dramatic action will get under way on Sunday November 25th at 19:00 GMT with Day 1A. Day 1B will follow on Thursday November 29th, also at 19:00 GMT, before Day 1C and 1D on Sunday 2nd and Monday 3rd of December. After one last-chance turbo opening flight, the survivors will reconvene on Tuesday December 4th at 19:00 for Day 2, with the MILLIONS Online Final Day the following day at the same time, where the champion – and three other millionaires – will be crowned. MILLIONS Online will make four millionaires, with the winner of the biggest single online tournament in history pocketing $2.5M. Second, third and fourth will earn $1.75M, $1.25M and $1M respectively. But it’s not just the last four that will end the tournament flush with newly-won riches, with just making the final table locking up at least $200,000. It’s expected that the top 400 will be paid in MILLIONS Online, with a min-cash worth $10,000. To view the full MILLIONS Online example payout, click here. The $20M guarantee will only be met if there are 4,000 entries. 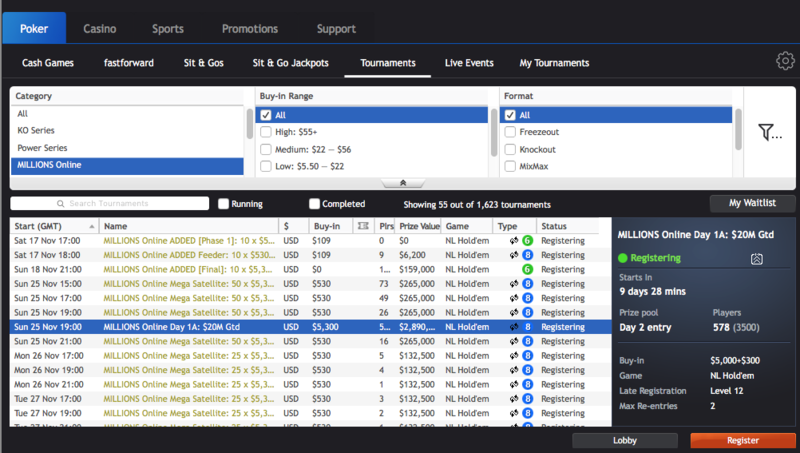 No other poker site has attempted anything quite this ambitious ever before. partypoker, partypoker LIVE and the MILLIONS tour continue to make poker history by setting gargantuan guarantees. Fortunately for you, the players, it means that millions of dollars of overlay could well be cascading down on those savvy enough to play the event. Don't miss out! The tournament will obliterate records. It’s going to be the biggest online poker tournament of all time, and it’s not even close. Last year’s MILLIONS Online created partypoker’s largest ever MTT prize pool, an impressive $5.1M, but then partypoker decided to take the unprecedented step of quadrupling the guarantee of the 2018 edition to $20 million, making MILLIONS Online simply unmissable. With a comprehensive schedule of satellites running now on partypoker, you can still win your way in to the record-breaking tournament. Check out the satellites on offer here, and it might just be you who ends up winning the beautiful trophy below.